Would it ever be possible in DR to be able to paint textures grass, decals onto brushwork/models rather than the current way? say a stone wall, would make it just beautiful. I don't know how hard this is, but it's my wishlist. Edited by NeonsStyle, 12 May 2017 - 11:49 AM. This is not a question whether DR could do it or not, but rather whether the id Tech engine can do it. Short answer, it cannot! Also, I don't know how about you, but I don't like just many assorted technologies just thrown in together. Like, mappers still have to familiarize with current state of the engine and the editor, and we're not even at the point of mesh tilesets done the modern way. The engine should have no problems with this. It's just taking two large patches, and using a tool to raise or lower areas you click drag on. Say one patch is textures with grass, and the other with paving. The advantage of this is you speed up making terrain over large areas a lot. We can already lay two or more textures over each other (we call them decals). If you're talking about UE's terrain tools, that would be a huge undertaking. If you take a closer look at this, it's a whole subsystem, where you can control the height, density, throw in tons of material layers etc. Having DR turned into UE would be cool actually, but I hope noone's seriously expecting it from TDM Team And speaking about modern functions, there are more pressing matters IMO, like having GUI material editor for example. Although again, I feel that might be a bit too much to ask for. Hum, i don't agree, i saw nothing on that video that made me say, yes this is pretty much impossible in idtech 4, what the artist was doing imo was just vertex painting or texture blending, two things you can render in idtech 4 just fine, just not inside DR (you can place decals but that is technically different from what i'm saying). Btw Judith, unless the TDM team removed it, idtech 4 has a GUI editor (from Quake 4) just type "editguis" on the console, just know this, it has the tendency to crash, so save often, and the gui preview inside the editor is not exactly how it will render ingame, specially if you put animations on it, is good for static GUI's tho. This is personal opinion but i think you really don't need a GUI editor if you are making GUI's, there's some console commands that imo make working on them a breeze. testgui guipath (if you put this on a shortcut or .bat file, for example "name.exe +set r_fullscreen 0 +set r_multiSamples 0 +set r_gamma 1 +set r_mode 6 +set vid_restart +testgui /guis/name.gui") it will open the game in a window and immediately open the gui, then just use "reloadGuis" on the console to see all the changes you make to the gui code, in almost real time without the need to start the game again or reload a map. Another nice command is "gui_debug 1" this makes the bounding boxes of the various windowDef's visible (just like the gui editor) and also shows the mouse screen coordinates, good to know the screen coordinates to input into the windowDef's. I think especially for new mappers lack of UI editor for scripts and materials is quite intimidating. Like, if someone's been using unreal engines up to this point, he or she may never needed to write a piece of code. lol yes sorry story of my life English not being my primary language, but you know what is also funny idtech 4 also has a material editor! Is not very intuitive but does the job, is not inside of DR but is better than nothing i suppose. Just type "materialEditor" on the console, be sure to run the game in window mode and disable AA. Like almost all vanilla idtech 4 tools is crash prone so save often, personally i use it mostly to preview materials when i'm on a hurry. edit: Btw don't mess with the "text" window if opening a hand made material, i found the hard way that it will delete all your custum code! Edited by HMart, 12 May 2017 - 07:17 PM. This has been discussed before and the main issue is, that geometry created inside DR does not hold any information about vertex colouring. So to add this feature we would have to change the map file format first. That is not really feasable, as this means that besides DR we would have to adjust TDM to understand the format, and all missions released thus far needs to be converted, too. There are ways to use texture blending on stuff created in DR. I've adjusted the DR ASE exporter a few years ago to support vertex blending. And a while ago I fiddled with fragment blending (that's how I call it), see my mapping thread. It might not be as comfortable as in UE, but it is better then nothing. And although these options exist, it is sparingly used. Finally I think that although such stuff is nice to play with and can add to the look of a mission, a good look doesn't neccessarely make for a good game or fm. And good games don't rely on such stuff only. As far as materials go it is not really coding. You just pick a material definition of something that roughly does what you want and alter it. And in the end nothing hinders people from learning basic coding. You have to learn how to use the level editor, too. Having to learn something doesn't seem to be a barrier, so they can learn this stuff, too. Also, Neonstyle was talking decals etc., which work like stamps. You pretty much paint your own texture within the editor. This is not simple vertex blending, but rather like the megatexture decal drawing feature from id Tech 5. So okay you do have some tools for terrain in UE4 but a lot of the time before that, people would still model it all out. As Obsttorte pointed out, the brush and patch system doesn't embed vertex colors or complex data. As far as I know material shaders only support white to black painted coverage (so no four RGBA channel blending available). My advice would be for you to make patches in DR, export them as OBJ and then paint vertex colors in lightwave. It doesn't take super modeler skills to do it either, just a working copy of lightwave and a tad bit of getting your feet wet to manage basic view navigation and operating the painting UI (which is really super simple). 1: LWO is a native file format for id4 that's extremely small and compact. 2: Lightwave saves to this format by the single push of a button (hotkey "s"). Achieving very quick testing iterations by using the console command reloadModels and tabbing between TDM and Lightwave till you like your result. 3: You're also chipping away at the brushcount by converting patches to models (always a plus!). 4: You can further clean up (and cull/remove) hidden faces that would otherwise be rendered were it a brushbased entity. I create the tiling textures in Substance Designer and then paint their coverage with Lightwave, so this is my exact workflow I'm using for my upcoming FM. 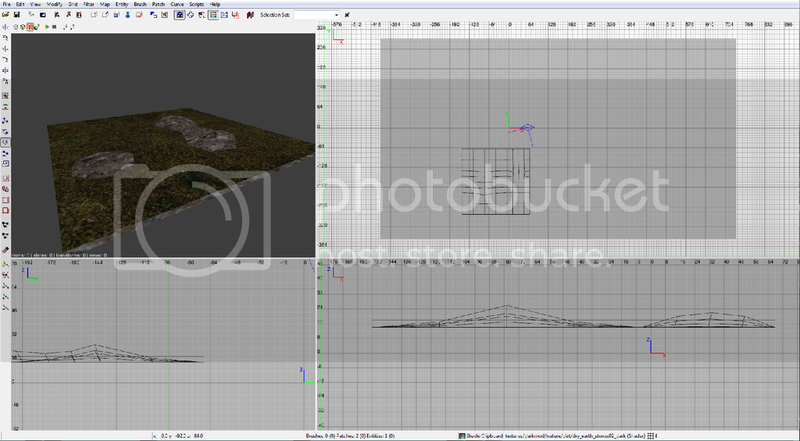 I would be more than happy to do up a tutorial so other mappers could pick up the method for terrain creation. All you need is a working copy of Lightwave (I'll leave the method of acquisition to your discretion). No problem HMart, I'm not an English native either, so maybe I wasn't clear enough I'll try that editor in the meantime, although previewing materials is not a big problem: I work on a source (.xcf) file in Gimp which exports flattened image to tga automatically, so I just iterate, pres Ctrl+E, and use reloadimages or reloaddecls command in game to see changes. You're writing from a perspective of a programmer who's used to that stuff, not an average user. An average user doesn't want to write anything, because: a ) it's super slow, b ) possibility of screwing something up is multiplied by 10 000. People would just want to plug in texture sources, fiddle with sliders or enter numbers using certain range, check the result, and move on to next task. IMO we should include ASE format for models in all workflows as well, as it's more common. People are more likely to be using Blender, Maya, Modo or 3dsmax, where formats like ASE, OBJ or FBX are part of standard export workflows (e.g. Unreal engines have been using ASE and FBX for years). Edited by Judith, 13 May 2017 - 01:49 AM. we just need something very simple, and not hard to do. Unreal 4 has some great tools, but most are beyond DR, but this one thing is possible. Edited by NeonsStyle, 13 May 2017 - 07:43 AM. The nice thing about the idtech 4 material editor is that it shows the ARB shader stages effects has well the materials animations using the keywords like scroll, translate etc, very handy imo, but not something you can't do some other way, no wonder the materialEditor is pretty much unknown. I'm learning programming (on my own) and even tho i don't consider my self a real programmer i found that it was a important skill to have as a game designer. Btw Modo supports .lwo natively, is the tool i use, it was made by ex lightwave engineers, Modo was also one of the tools used by id Software to make Doom 3 maps and afaik it does not support ASE. edit: NeonStyle terrain editing on DR will be a feature that will take a large amount of time to implement if ever, so the best you can do, is go to the next best thing, that is to use one of the free terrain editors on the internet and then prepare them for import into TDM using blender for example or learn how to model and paint terrain directly inside Blender, is not that hard. Just know that any large terrain made in a 3D tool needs to be cut into relative small sections, and assembled inside DR just like the Springheel modules, so idtech 4 doesn't render the all thing at once when a light strikes a small part of the terrain surface. Edited by HMart, 13 May 2017 - 08:42 AM. But we are not talking about average users. An average user is the guy who plays the missions. If you are repairing your car on your own, you are no average user, you have to learn how the stuff works. If you are growing plants for food you are no average user, you have to learn this stuff, too. If you want to do more then just creating a simple mission, you have to acquire the skills needed. And if you don't want to (for whatever reason), you can only create something simple. I don't have the time and motivation to learn how to use a modeling program. But I don't complain about DR not having a simple way of letting me create complex models. Because what ... it would be silly. If I want to create something better in that respect it is my responsebility to acquire the skills needed. I thought it was obvious that I meant average editor user, a level designer, who is used to do everything by the means of user interface, as opposed to writing code, learning syntax etc. And this is completely normal, other game editors out there have graphical user interfaces for as many things as possible. It's faster, it's one less obstacle to struggle with, and one less potential source of errors. Also, noone's expecting game editors to be modeling packages, just as noone is expecting it to be sound editing programs. This is where all aspects of game design come together, and while the external assets (sounds, textures, meshes etc.) are created in external programs, the way the engine handles them is internal. And those tools have to be accessible as well, to streamline work, to allow faster learning, and to minimize errors mentioned above. I know idtech4 is an in-house engine, and art + programming teams' collaboration in big studios is a normal thing, but defending code writing in this day and age is a bit ridiculous, especially for amateur personal projects. It is more the other way round imho. In industry several persons are working on one project. In this case it is simply more effective if people get specialized instead of having to learn everything. In our case normally one person is working on one project. That is an completely different situation to start with. I agree that it would be much easier if you could do complicated things with just a few clicks, but this also means someone has to implement it. This is a lot of work. So whoever has the capability to do this (and there are only two persons currently coming to my mind) has to outweight the time needed compared to the benefits. And doing so might not lead him to the same conlusion like you. But my personal opinion is that it is much more beneficial if mappers start to dig into different aspects of game design over time. They don't have to learn everything, and they don't have to learn it from the beginning on. But if you manage to acquire the basic skills needed, it doesn't hurt to think outside the box. I often see mappers trying to do this actually. A few of them start to learn how to model for example, some others fiddle with audio stuff, image manipulation or video editing. But for some reason everyone rejects to learn coding for whatever reason, even behaving like the suggestion to do this would be ridiculous, but on the other hand they are asking for features over and over again which can only be implemented by coders. This is a bit of a contradiction to me. And regarding the workflow in industry. Even though it is efficient to have specialized personal it can be very beneficial if those specialists have at least a basic understanding of what the other guys are doing. It helps communicating, evaluating and appreciating the work others are doing. People trying to do this, for sure. But you are only really capable of doing so if you understand the work of others. The things you write also suggest that being a level designer would be something ordinary, whereas codewriting or modeling is something special. I don't know how you come to that conclusion. Sure, people start with learning the level editor first, simple because it is the locigal first step. But that doesn't mean that taking the time to learn how to use the editor, developing your own workflow and optimizing it is in any way average. It isn't. We are talking about something that can easely take years. I don't see why someone who has the personality to do this should not be capable of acquiring additional skills. That's why I'm not expecting TDM Team to write a sophisticated node-based material editor, or any material editor for that matter, I wish ID did it properly back then, just like other companies did (at least those who made their engines available to the public). And also, I don't need to dabble in code to understand, more or less, how scripting works, or how graphic pipeline works. Your perspective concentrates only on your approach and your particular experiences, which are not common, I think. Most people want to dedicate their time to practice one, maybe two specialties. Learning is fun, we get it, it's obvious. But not learning everything, and that also should be obvious. Level design already requires you to be a jack of quite many trades, and being jack of all trades, and master of none ultimately will be visible in your work. They were capable of creating a good game on top of an engine allowing others to create this wonderful mod (well, standalone total conversion). I don't see they did anything wrong. Your perspective concentrates only on your approach and your particular experiences, which are not common, I think. Learning is fun, we get it, it's obvious. I've never said that. It is a time-consuming and often tedious work. Sitting in the sun in front of a barbecue with a beer in your hand is fun. Level design already requires you to be a jack of quite many trades, and being jack of all trades, and master of none ultimately will be visible in your work. However. It is not my aim to convince you of my opinion. I have my reasons to think the way I do and you have yours, and I think both opinions are valid. I just tried to express why I think the way I do. There are plenty of engines from that time that incorporate a lot of scripting (largely shared in how materials were setup). Besides gameplay functions (done in simplified C++ expressions) the rest is largely very simple and straight forward in material authoring. Even on the scripting front there's a lot of predefined examples, along with custom defs and scripts to fall back on and reuse for FMs wholesale. Solid art and design doesn't rely solely on using a full visual featured interface and node based editor to make a good game. Yes Unreal is a great engine but what it makes up for in artist friendly UI, it fails to accommodate in methods of BSP blockouts and more practical designing. Saying someone can't produce a good level due to spanning a larger skill gap; is like telling someone from the 50s they're bad drivers because they had manuals and we drive automatics. We get that you like Unreal's approach. That's great but this is a much different engine that requires you to adapt to it's unique work environment. Yes Unreal is a great engine but what it makes up for in artist friendly UI, it fails to accommodate in methods of BSP blockouts and more practical designing. It would be very interesting if you could elaborate on that. One of the most powerful usages of editors like Hammer and Radiant has been the ability to quickly create, iterate and expand layouts during the blockout phase. Epic has brought a little bit more work-ability to brushwork (very recently) but had almost completely neglected any form of good brushwork manipulation in the past. This I think was more in an attempt to drive people to use models exclusively (which isn't bad for the final product). However it's awful when trying to start a level when in the concept and design phase. This pushed users to create tools like HamUEr so they could create the level in older editors and import scales and bounding info when done. Overall I still really love Unreal personally. I'm not working exclusively in it right now as I'm more into creating a playable game (in TDM) than pure art pieces. That's... Weird point of view, to say the least. Yes, Unreal doesn't have this fast brush resizing by dragging mouse at the side of a brush. Also UE doesn't have patches, and BSP doesn't use surface smoothing, as it never did. Then again, BSP is used solely to block out basic environment/gameplay space these days, and then it's entirely replaced by static meshes, for both quality and performance reasons. And by these days I mean roughly since 2006. How did this get from a discussion about an improvement of DR into a discussion on should've beens in Id? two patches to be pushed and pulled and blended.